Adam Gillen as Wolfgang Mozart and Lucian Msamati as Antonio Salieri in Amadeus at the National Theatre. Photo: Marc Brenner. 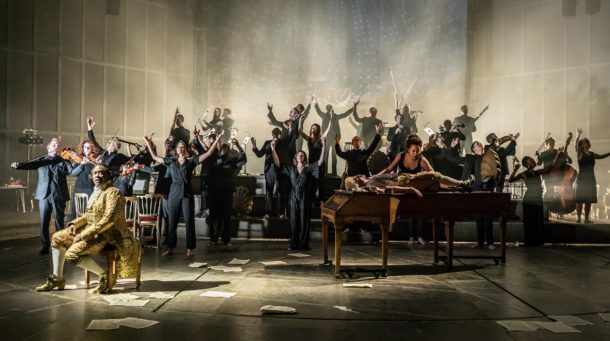 When Rufus Norris replaced the popular Nick Hytner as director of the British National Theatre in 2016, there was a certain amount of apprehension. Although Norris had produced a number of exciting and innovative works, primarily at the Young Vic, in the early years of this century, he had never directed a major house, and there were fears that he was not up to the job. 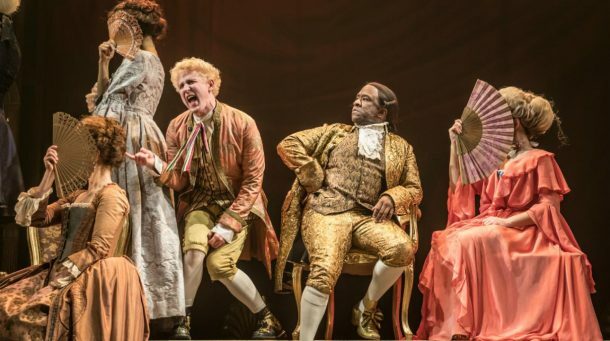 So far his record has been mixed, with a number of not very successful new works and only one unqualified success, a revival of Peter Schaffer’s epic musical psychodrama Amadeus in October of 2016 (the play had premiered at this same theatre in 1979). The event was given increased significance by the death of its noted author in June of that year. 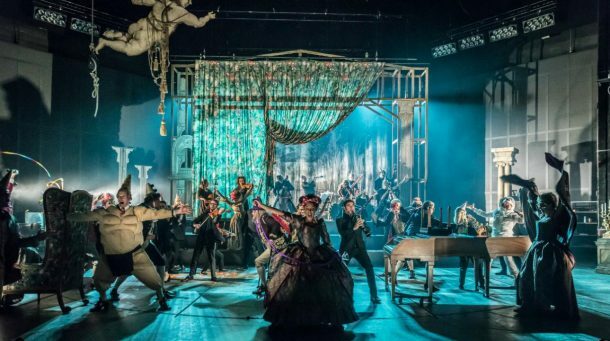 Amadeus at the National Theatre. Photo: Marc Brenner. Given that great success, and the rather indifferent reception of other Norris offerings, it is not surprising that the National should revive this production at the beginning of 2017, and I attended the opening production of this much-anticipated revival. I found it well deserving of the praise it has received, and the credit for its success goes not to any single artist but to an unusually effective combination of talents. The play is of course dominated by two monumental figures, the narrator Salieri and the nemesis whom he claims to have destroyed, Mozart. Lucian Msamati is brilliant as the agonized Salieri, hailed as the greatest composer of his time, but inwardly obsessed by the knowledge that the clown/genius Mozart’s work is vastly superior to his own. Msamati, almost constantly on stage, provides an admirable range of emotional tonality, with touches of the delight in plotting and manipulation that recall his much-praised Iago at the Royal Shakespeare Company in 2015. 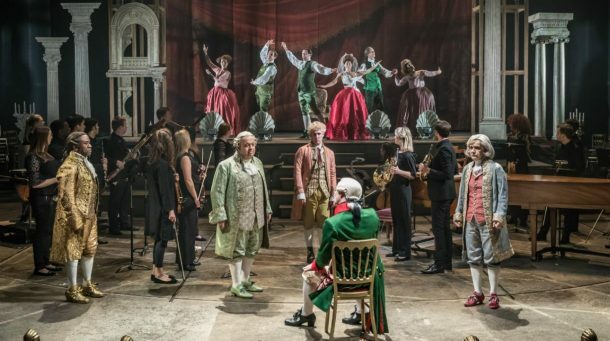 The other pole in the production is Mozart, played by Adam Gillen, in an interpretation that is as overpowering as Msamati’s but in a completely different direction. Gillen is a hyperactive, almost hysterical sort of court jester figure in flamboyant but tasteless costume and bleach-blond hair, who almost obsessively shocks both Salieri and the court with his off-color comments and irreverent actions (including at one point dancing on the piano). Powerfully realized as these two pivotal opponents are, what most impressed me, in contrast to other productions of the play that I have seen, including the original and the film version, was the memorable and innovative staging by Michael Longhurst. Longhurst had the brilliant idea of utilizing an actual orchestra, the Southbank Sinfonia, as a kind of onstage chorus, providing both the required period music and also other accompaniment, both musical and physical. Sometimes they appear upstage within a suggested frame as an actual orchestra performing a fragment of Mozart’s work, but at other times they flit about the huge stage suggesting citizens of Vienna, members of the imperial court, or ghostly spirits of that time or later, called up by the story or the music. At times they advance on Salieri as a menacing group, or surround him as adulating admirers (two of them serve as messengers bringing him news from the street), but more often they permeate the entire stage picture, adding a flow and dimensionality to the whole. I particularly remember a violinist lying alone far downstage on her back, softly adding an elegiac note to one of Salieri’s agonized self-appraisals. There is another wonderful moment when Salieri ruffles through a portfolio of Mozart’s sketches and as his eyes light on each new passage, the orchestra plays that fragment—an overwhelming testimony to the genius and variety of his rival’s work that clearly indicates how formidable an opponent Salieri faces. A powerful ensemble fills out this strong evening of theatre. Karla Crome as Mozart’s wife, Constanze, provides a shrewd and competent accompaniment to both her bizarre mercurial husband and the manipulative Salieri, into whose dark soul she sees better than anyone else. Tom Edden as the Emperor beautifully catches the note of foolish foppery which covers a deeper shrewdness. Hugh Sachs as Rosenberg and Geoffrey Bowers as van Swieten contrast nicely with each other and top off a rich and colorful assemblage making up the Imperial court. The setting, by Chloe Lamford, makes excellent use of the vast Olivier stage. There is no attempt at realistic décor—on the contrary, everything is presented with a fluid minimalism. Perhaps most elaborate is the theatre where some of the Mozart work is presented, for which a raised platform at the rear of the stage presents the acting area, surrounded by a sketchy proscenium arch, bits of flowing drapery, cavorting cupids, and a line of footlights, all set against an open background and with the major part of the stage representing a huge open orchestra. Often a room is represented by a piano or a single chair, and some of the most effective scenes have no furnishings at all, only one or two actors, usually Salieri. He sometimes stands in an open, illuminated circle of light downstage, the only scenic background being the silhouettes of bits of hanging curtains upstage, waiting to be brought into use, supplemented often by the silhouettes of the often presenting symphonic chorus. Some music critics have complained of the historical inaccuracies of the piece, of its irreverent treatment of Mozart and deprecating depiction of Salieri as a composer, but these seem trifling matters in the face of a story so beautifully presented, and lifted by some of the most glorious music ever written.